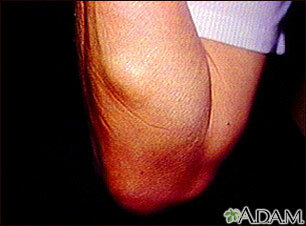 A lipoma is a noncancerous growth of fatty tissue cells. A lipoma can develop in almost any organ of the body although they are most commonly found in the subcutaneous layer just below the skin. A lipoma usually grows slowly and is a nonpainful mass that is soft and moveable under the skin. Lipomas can also be associated with other syndromes where they are not so harmless. In the rare disease adiposis dolorosa there is swelling of the body and fatty deposits (lipomas) which apply pressure to the nerves, resulting in weakness and sometimes extreme pain. The amount of discomfort, irritation, or pain from the growth of a lipoma depends upon where in the body and what surrounding tissue or organ the lipoma has affected.